T.C. Eggington’s, a family-owned Mesa breakfast, brunch and lunch spot for more than 30 years, has released an all-new brunch menu with hearty a.m. eats like Croque Monsieur and a spicy chipotle egg burrito. 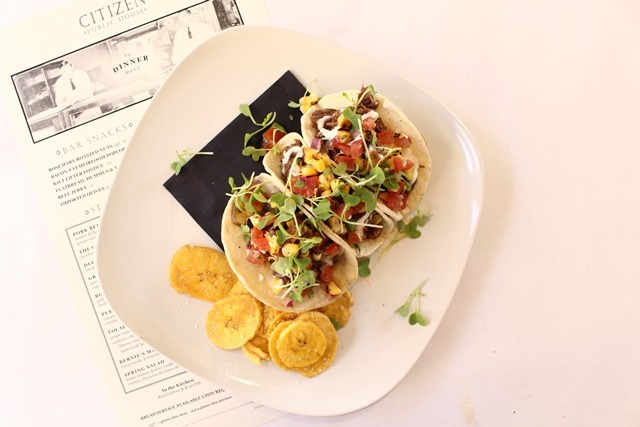 Citizen Public House (pictured) and The Gladly have come out with their new seasonal menus, which debuted last week. The menus are eclectic and thoughtful, featuring dishes (like branzino) not often available in the Phoenix market. New items include: an octopus dish, pork cheeks, seared chia tuna, a Cornish game hen, apple bourbon bread pudding, and many others. Macayo’s National Margarita Day special promotion was such a hit with their guests they have decided to continue it as their Margarita Monday special. Now guests can create their very own unique margarita, every Monday at all Arizona locations. Given as a symbol of friendship to the United States by Japan, cherry trees line our nation’s capital and their blossoming signifies the arrival of springtime. Sprinkles celebrates this gift with the cherry cupcake. Made with loads of sweet, pureed cherries in both the cake and frosting, these delicious cupcakes are available from March 20 to April 17. The Refuge, a café located in Central Phoenix, has announced a new menu that includes breakfast all day and a special weekend brunch. The Refuge is open daily and serves breakfast, lunch and light fare and cocktails in the evening. The new food offerings include a build-your-own grilled cheese, a club sandwich, and cobb and Greek salads. For March and April, Grimaldi’s Pizzeria will be featuring a caramel-coconut cheesecake and a Reese’s Peanut Butter Cup cheesecake. The caramel cheesecake topped with caramel glaze and toasted coconut, on top of an Oreo cookie crust and finished with a chocolate drizzle and whipped cream. The Reese’s Peanut Butter Cup cheesecake is a creamy vanilla cheesecake sprinkles with chunks of Reese’s Peanut Butter Cups and topped with whipped cream. Celebrate the arrival of spring at Fogo de Chão with innovative new menu items featuring the season’s best flavors and ingredients. New menu items include Forbidden Black Rice Salad, edamame roasted corn salad and spring pea and asparagus soup, in addition to new seasonal cocktails. For more fab foodie news, become a follower on Facebook, Twitter @AZFoothillsFood and Instagram @AZFoothills.